In the kitchen I don’t usually know what I’m going to make for dinner the day before, or even the morning of. This mostly stems from the fact that I subscribe to a CSA where I get what I get each week. At the market, I usually want to try every vegetable I see in front of me, and this just adds to the produce in the kitchen. I improvise and cook up meals each night with what needs to be used in the fridge, and then what I actually make is dictated by how much time I have--this just contributes to the creativity and learning process. I have big hopes for my new front yard garden. We’ll have three raised planter beds amidst other native flowers, bushes, and trees. I hope for it to be a tended but wild garden--not too perfect looking--wild enough to attract the bees and butterflies and be a natural extension of the forest that lies right next to our yard. The neighbouring forest is part of the Acadia University Botanical Gardens where I volunteer and learn about and propagate the native plants. We hike through the forest almost every day. This is where I draw my inspiration and energy. I hope that my son will find inspiration outside like I do. I also hope to learn about gardening together. I want to share all my discoveries with Llewyn--to take him to the farm and meet our farmers, study the mushrooms growing underfoot, study the leaves, learn what’s edible and what is not--to take our findings back into the kitchen and create something together. 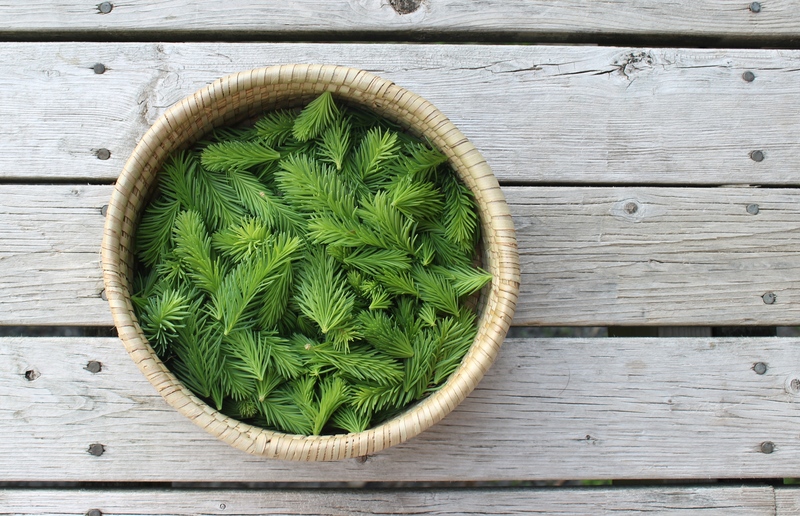 One of my first adventures in the forest and in the kitchen with Llewyn was to create a spruce tip jelly from the spruce trees in the forest by our house. 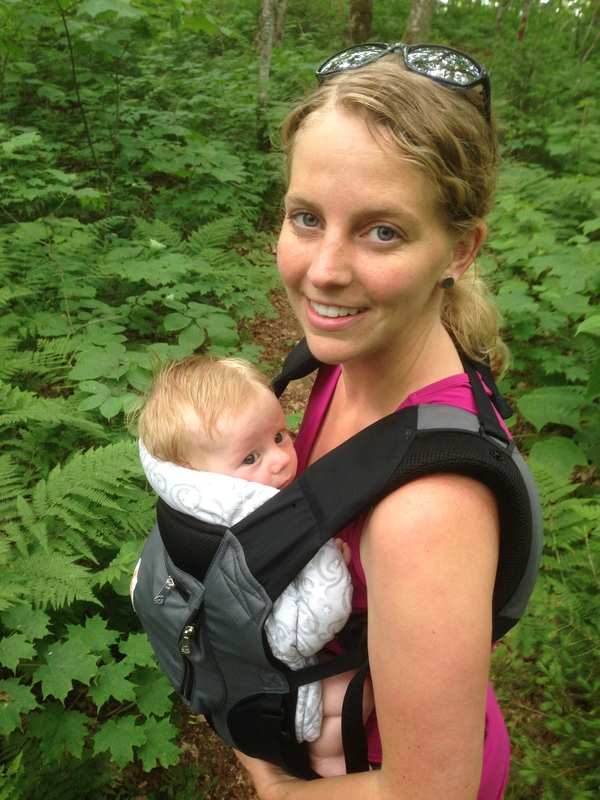 I carried him all snug in the carrier on my front with my backpack on to pack it full of spruce tips. We also went as a family--Zak and I harvested the tips along the edge of the forest facing the sidewalk while Llewyn waited/slept in the stroller. We’ve been enjoying the jelly with friends (along with lots of cheese!) who come to visit. Next year, we’ll be dreaming up other ways of enjoying hikes, harvesting spruce tips (and other edibles from the forest and our garden), and making jelly or whatever else we can dream up. Before Llewyn my explorations in the kitchen revolved around soup. It’s a big part of how Zak and I met. 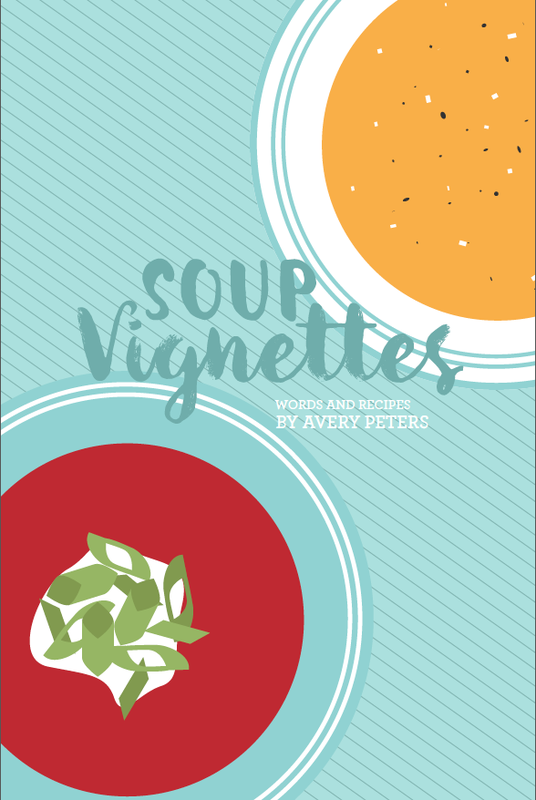 Sign up for my quarterly newsletter here and you can enjoy the story in Soup Vignettes of how we got to know each other and two recipes for our favourite soups. It's a beautiful 7-page PDF designed by my friend Elise Epp at Elise Epp Design.